Sometimes within minutes you get to see the first dolphins of the day, which seem to come out of nowhere to play and frolic around Temptation’s hulls. They don’t even go looking for dolphins, the dolphins come to the vessel. Please be assured the dolphins are NOT fed or coaxed in any way. They are wild dolphins that know the vessel and know they are not in any danger. 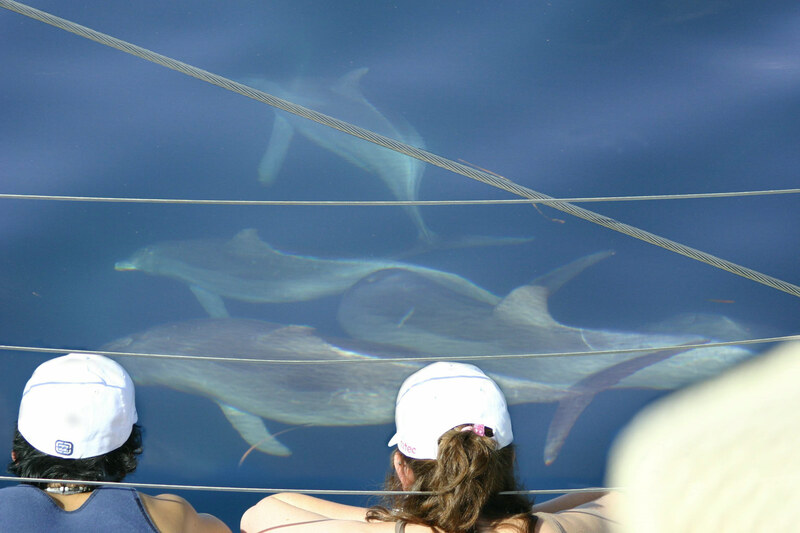 Temptation has been operating the Dolphin swim and watch cruise for over eleven years and they still have a 100% success rate of seeing dolphins. The gulf they operate in is home to thousands of dolphins. Temptation operates from Holdfast Shores Marina, Glenelg – which is only 15 minutes from Adelaide CBD. It is a magnificent complex comprising the marina, many restuarants, retail shops and apartments. It is also close to Jetty Road which is the main street of Glenelg that is full of shops and restaurants. So, plan on spending the whole day at Glenelg to explore.